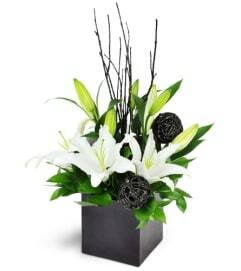 Shimmer and Shine Bouquet reflect the beauty of the spring season with a modern styling your special recipient will adore! 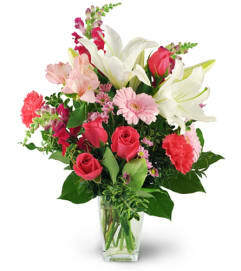 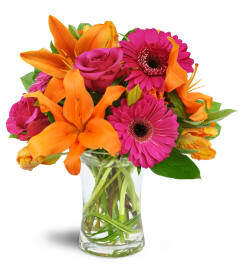 Stargazer Lilies make a show-stopping appearance in this spring bouquet, surrounded by pale pink roses, pink stock, lavender stock, and lush greens to create a truly stunning look. 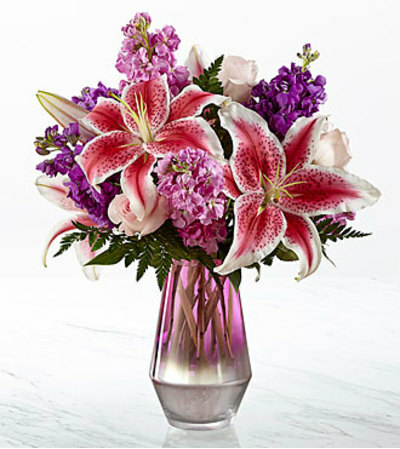 Presented in a keepsake shining silver and lavender ombre inspired glass vase, this gorgeous fresh flower arrangement is created just for you to send your warmest Mother's Day, Easter, birthday, or anniversary wishes.